As with many professions which historically were dominated by men, the STEM fields have seen a slow, but continuous, increase of women in the workforce over the last decades. One field is, however, standing out in the crowd, and is facing the opposite trend. Computer Science, which for a long time was one of the strongholds of STEM where women made up a substantial amount of the workforce, has seen quite a dramatic decrease since the 1990’s. From a decent 37% in the US in 1995 to only 24% in 2017. Sadly, current projections show that this number is most likely going to fall further in the next decade. Tech has become a male-dominated field, and it is not looking like it will change anytime soon. How did we end up here? Why are millennial women who grew up surrounded by computers and technology less likely to end up in the field than their baby-boom mothers? And finally—how do we turn the tide? During the second world war, when all calculations had to be done by hand and triple-checked manually, the rapid increase in need for ‘computational power’ to do complex calculations was solved by hiring hundreds of women. At the end of the war, women were working on some of the most top-secret military projects, and e.g. played an important part in developing the world’s first general purpose computer – the ENIAC. In the years that followed, creating software was seen as women’s work, a good alternative to being a secretary. It was considered easy and not of the same importance as the hardware components their male counterparts were working on developing. – “It is like planning a dinner”. Although the intentions might not have been the best, the circumstances led to many of the important pioneers in computing being women, something which has been little known to the public before movies like The Imitation Game (2014) or Hidden Figures (2016). The percentage of female Computer Science majors also steadily rose to about 25% by the mid-80’s. After the general computer hit the consumer market and sparked the beginning of the Silicon Valley boom, men started to shift their focus from hardware development to software engineering. The aspirational young man found an idol in visionaries like Steve Jobs and Bill Gates, and the computer found its way into the bedroom of many a boy. With the rise of the computer came also computer games and being considered as toys – which had to be gendered – they were placed in the boys’ section. The image of the male computer nerd got a strong foothold in pop culture, and by the mid 90’s, the number of women in computer science began to decrease until the point where we are today. crowd, they show no fear of technology at all. 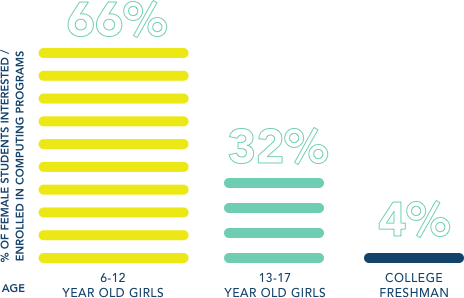 In fact, 66% of girls age 6-12 say they are themselves interested in, or currently enrolled in, computing programs. When entering middle school, however, the number drops dramatically, and when asking the same question to 13-17-year-olds, the number has been reduced to just 35 %. At the point of entering college, only 4 % of girls say they are interested or enrolled in a computing program. So, what happens during these critical years? A multitude of factors seems to be influential, but some are of higher importance than others. Research from Accenture and Girls Who Code shows that just getting exposure to computing in junior high increases the likelihood of showing interest later by 18%. However, exposure alone is not enough to increase the percentage of girls pursuing an actual career in computer science. Role models, however, seem to have a real impact. While boys’ level of interest in computing/coding was not influenced by the gender of the teacher, girls’ interest was significantly higher if they had female teachers. High school girls who had an inspiring teacher, independent of gender, were also almost three times more likely to say they were interested in studying computing, compared to their counterparts. Finally, a lack of other girls in computing class was shown to reduce their interest by 33%. Then how should we go about to spark and sustain girls’ interest in coding? As mentioned, catching the girls early in junior high and deepening their hands-on experience is important. Here computer games could have a positive impact. Girls who play computer games at a young age are found to be four times more likely to go into computing or coding roles as adults than those who don’t. (Accenture & Girls Who Code) The impression of computing matter too, and maintaining the perception that computing is something fun, cool rather than geeky through the years of junior high is crucial. Here popular culture might do a better job, for example, are male computer scientists and engineers found to outnumber women by 14.25 to 1 in family movies according to Computer Science for All. Parents and teachers could do also do a lot to convey the importance of computing, but sadly these two groups are not found to think of computing as something that could be applied to societal problems. In fact, only 17% of parents and 11% of teachers say they believe it can change the world. A shocking 66% of computing teachers say that they would rather be teaching something else. Finally, there’s a need for more female teachers in computer science. Efforts to attract more female teachers should be supplemented with bringing in young professionals from the business to make it more understandable for kids what they can become by pursuing a career in computing. Women developed computer science, not just men. Programming is inherently gender neutral, but with the disruptive effects it has on our society, it is both a societal and economic problem if women are underrepresented as computer science and technology evolves. Increasing the number of women in a male-dominated business is challenging. Luckily there are some positive outlooks. Today, more than 60% of girls in junior high and high school thinks of computing as cool. Hopefully, this will only increase in the years to come.